I’m sure this isn’t unique to myself, but I thought I’d share anyways. The other week I was taking Wifey out shopping (because I’m an awesome husband), and when out we walked into a video game store (because I’m also proficient in nerdisms) I noticed another guy who looked in his late teens or early 20s in crutches. Since I’m a bit nosey by nature, I instinctively looked to his feet, and noticed he only had one leg. I couldn’t tell if he was an above-knee or below-knee amputee, but still, it was there (or rather, it wasn’t :P). My first instinct was to walk up to him and say “Hi” and see how he was going, purely on the basis of him being an amputee, but I hesitated… I mean, I’m pretty comfortable with having only one leg and talking to people about it, but I know not all amputees feel this way. What if the loss of his limb and talking about it upset him? What if he misinterpreted my good intentions and thought I was poking fun at him or drawing unnecessary attention? What if he’s actually been a long-term amputee and his stump was knackered, and the reason he was getting around the place on crutches was because of that and thought I was being condesecending? I was wearing shorts that day with the titanium pole exposed so he would have easily been able to see I was a fellow amputee, but still, I was worried. So I didn’t say anything, because I was concerned about coming off without the good intentions that I had. The question I’m asking myself aloud is – is it cool to go up to a fellow amputee and just say “Hi” and ask how they’re doing? It’s weird, whenever I see another amputee out and about I always have that urge. I know it must be human instinct, but still – that little voice of hesitation is always there. One of the few times I’ve acted on it was a feew years ago when I was walking to catch a train home after Uni finished for the day – I was walking with Wifey (well, she wasn’t Wifey back then since we weren’t married :P) and came to a stop along the footpath where one of gates for bike/vehicle access to the Uni was located. As I was standing there or walking up to it, I noticed a guy on his bike had one leg. So, being the person I am, I stopped for a chat. I was also my usual subtle self, pointing to his leg and stating, “Hey, I have one of those too”. The guy looked at me with this kind of inquisitive look (possibly verging on delivering a headbutt) so I reached down and pulled up the leg on my jeans, revealing my prosthesis like the shining symbol of awesome gimpyness that it is. Going back to my original story – owing to this happening, I’m looking at ways that maybe I can get involved in the wider amputee community. I’m not sure in what capacity at this stage, but I’ve been meaning to join the forums over at the excellent Limbs 4 Life website, which I’ve mentioned previously and currently have links setup on the blog’s sidebar so people can easily access the site from here. I’m not such how else I want to involve myself in the community at this stage (there’s ultimately only so much time free during the week), though Wifey’s been really supportive and has encouraged me to get more involved and help other people out due to my positive attitude towards my leg. 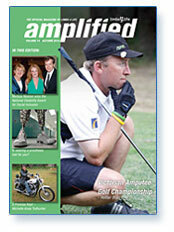 For those who haven’t checked out their site before, I’d encourage you to stop by and check it out – they’ve also recently released the latest edition of amplified, a quarterly magazine published via their website as a high quality PDF. I took the time to read through the latest issue in full (thanks Wifey 🙂 ), and there were some great articles and personal experiences therein. There’s also (as of next issue) going to be the chance for amputees to write in and ask questions. Best of all is that it’s free, so no cost for access to an extremely professional publication on a niche topic. Brilliant work. Hmmm, I think I got sidetracked there, sorry about that! Back in February, one of the guys I train with mentioned that he saw a topic in one of the forums he frequents that was started by someone who had one of his legs amputated recently, and was seeing if anyone else out there was suffering from the same condition. I jumped in and made a few posts, but one of the guys on there jumped into the conversation as his daughter had her leg amputated below the knee a while ago and was curious how she’d fare when she got to school age and how other kids might react to her condition. As someone who has had their leg amputated as a child (see the bio, as well as my posts on growing up as an amputee and my medical history), I figured I might be able to offer some advice on what to expect and I sent him a lengthy response over e-mail. I was thinking about this the other day, and thought it probably wouldn’t be such a bad idea to post an amended version up here. I think it’s worth prefacing that other amputees’ circumstances may be different to mine – even when looking at gender, there are differences in how girls and boys react to things by nature of the social norms obliged by gender/society, so keep in mind I’m a guy and grew up in that environment. There’s also the extent of the amputation – amputation at the ankle, below the knee or above the knee – my above-knee prosthesis slipped on my stump and then the prosthesis attached to my body with a big metal and leather waist band. Gotta love technology in the 80s, hopefully suction technology’s become the norm for kids these days, and things are better. There’s no comparison to the options available as a kid and the leg I have now, so keep that in mind too! Anywho, about me growing up – got paid out and rubbished heaps because of my leg, both from kids in my class/year level, and from all the big kids as well at school. It’s hard and makes you angry as a kid (and frustrating as a parent watching on) – I had all sorts of aggression issues when I was a kid, and thinking back I’d say it was a combination of my cheeky personality (I blame it on being a middle child and a ranga!) and my issues with my leg and the baggage that comes with that. I wasn’t able to verbalise my issues and work through all those emotions because of how young I was, and it’s only been as I’ve gotten older that I can trace back to when I started to accept and work through my feelings and that this coincided with when I started getting in less trouble at school… so from the age of about 6 – 11 I was a bit of a handful (understatement), but I mellowed out from then onwards, and continue to be pretty chilled out these days. It wasn’t all negative though – I always had a good group of friends who would stick up for me and didn’t care about the leg. In fact, over the years it came in handy and we’d take the piss about it, so it’s all good 🙂 Like when McAdam and I were a bit inebriated at a party and at one point in the evening my leg ended up on the clothesline and didn’t come down for the rest of the night 😀 Kids can be cruel, and if you stand out, it means you’re likely to get on the receiving end of stuff. A good group of friends will always make a world of difference though. On the other side, having to plough through life on one leg and coming out of it well makes you stronger for the experience – I used to physically fall over all the time when I was a kid because of the leg, and what Mum and Dad had to do (and it broke their heart) was to learn to not fuss over it and let me get myself up and going again, and resist the urge to pick me up each time. One time they even got a mouthful from a mother who came and helped me up when I’d fallen over at a park and thought they were ignoring me! I became a very independent kid and remain a very independent adult, almost to a fault at times. But hey, life experience – that’s what it’s all about. I wouldn’t be as strong-willed today if it weren’t for their emphasis growing up that I had to learn to look after myself. If you have a child who has had an amputation, the best thing you can do (if my memory holds up :P) is to just reinforce how much you love them, and prepare them by not whitewashing about stuff when they get a hard time from kids at school. Teach them to be strong-willed and independent, and keep up with all the extra-curricular stuff they might be interested in doing, like swimming (great life skill anyways, but for an amputee it helps bridge the gap and keep up with the rest of the kids if you’re a good swimmer! ), dancing/martial arts (great for gait, fitness, weight [weight is extremely important as an amputee, as fluctuations affect how the socket fits the stump] and tempering the stump), basketball, etc. As a kid I was always doing something – swimming was awesome as loved being able to beat everyone in class once we got in the pool because nobody expected it (! ), and I used to play hockey, basketball, footy (though I was a bit crap at footy, but still ran around anyways! ), Taekwondo (to be honest this actually helped control some of my aggression and taught me to channel it in much more productive ways), tennis, even all the track stuff like hurdles and other athletics. Again, I was a bit rubbish at them, but I enjoyed giving them a go and was always active as a kid. Despite being a chubby ranga! Things changed a lot in high school as the divide between the sporty kids and the not-so sporty kids inadvertently put you into cliques (there was no way I could keep up with everyone in high school so I stopped being active and focused more on studying instead, though looking back I wished I started doing karate when I was a teenager! )… though again, this might also be just what happens with guys, and given the quality of the prosthetics now, your child’s mileage may vary. With girls, since there can be some pretty full-on psychological bullying and bitchiness in high school, I’m not sure how that would come into it (and my solution for tormenting and bullying from another boy was hardly eloquent – I’d start a fight and try and kick them with my fake leg :P). As long as your child is strong-willed and has a solid emotional foundation, that’s probably all your can do. The good news is that once school’s done, society’s a different beast and I’ve never been discriminated against in the workplace, and I’ve been consistently employed since I started with part-time work after school when I was 15. There may be a few things that might be out of her league (i.e. stuff that’s particularly physically demanding on their legs, but again, mileage will vary because of the child’s stump), but over time they will learn her limits and roll with it, just as I have. There’s definitely plenty of other anecdotes I can talk about on the blog with regards to growing up as an amputee and some of the things you have to deal with, but I figure this is getting pretty lengthy already, so it’s probably best to leave it be. I’ll add more experiences ad-hoc, and remember that they’ll all be categorised under the “History” category for easy access in the future. Well, looks like I didn’t get around to putting up that extra blog post last week 😛 Apologies for that, the weekend turned out to be pretty busy, and I didn’t get around to doing some training on the boxing bag either 😛 I’ll definitely have to get around to doing some leg stretches the next few days though – my form will be particularly crap on Wednesday if I don’t. So, today I thought I’d get started on telling how I lost my leg. Hopefully it’ll prove interesting, and I’m not sure if this will take a single post, or a couple to get through, so we’ll just see how we go. 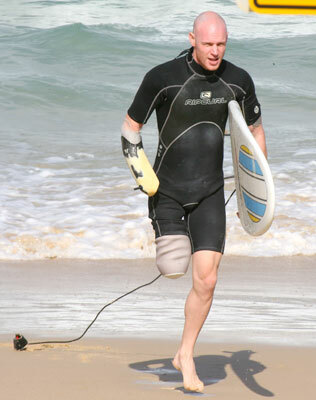 Unlike a number of amputees, I lost my leg when I was still a baby – I was about 3 months old when they chopped it off, actually. Telling how this happened is a little tricky, as I was obviously too young to remember, so I’ll be reconstructing this using the collective memory of what my parents have told me since then. My Mum noticed that after birth, my left leg seemed a little swollen compared to my right, and brought it to the paediatrician’s attention, who didn’t seem too concerned with it. A few weeks later (maybe a month?) the swelling hadn’t gone down, and Mum always tells how she noticed things were getting really bad when she felt behind the knee cap and noticed I was bleeding out the back of it (as opposed to sweating, for example). Given this wasn’t exactly the ideal condition you want your child in, she took me to hospital to get it checked out. I had a “strawberry birthmark” on my leg as a baby, also known as a ‘hemangioma’. These things seem to be relatively harmless in most cases from the stuff I’ve read, excepting the cases where they’re near, say, and eye or another organ. I’ll admit ignorance here, so I hopefully haven’t offended anyone with that broad generalisation, ’cause I have heard where they have caused some serious problems. Anyway, this is where my understanding gets fuzzy of things – it was a particular hemangioma that caused the problems with my leg. The resulting swelling saw my left leg balloon to this crazy degree – my folks have some pictures of me when I was in hospital as a kid, and my left leg looks at least 30 – 60% larger than my right leg, is all swelled up and is bright pink and purple from the bruising. Crazy stuff. I’ve been told that the swelling got so intense that it literally crushed the bone, which in turn caused the leg to turn gangrenous. Compounding this, an air bubble formed in the blood in my lower leg, which has the capacity to shut down the heart if given the opportunity to travel through the bloodstream. So, in short, the leg was in a very bad state, and I was accordingly in a very bad state, teetering on that ethereal threshold between life and death (not that I would have used those words as a 3-month-old baby, but oh well – I’m an Arts student, I’m trained to use flamboyant language!). It was really serious stuff, and my parents went through a helluva lot during that period. So anyways, apparently my Dad finally got him to agree to amputate the leg in order to save my life, but instead of organising something urgently (this was late in the week, maybe a Friday? ), he wanted to fly someone over from Melbourne to take care of it the week after. This wasn’t all that practical, given the state I was in. After more ‘discussions’, he finally conceded and a local doctor, whom we shall refer to as Doctor Tenshi (or maybe that should be Tenshi-sensei, if we’re going for the Japanese thing), came in and saved my life. Literally, it was his work on me in the operating theatre that saved my life. He’s awesome, uber, golden, all that – the name’s quite fitting: Tenshi is the Japanese word for spirits that are kinda like angels in the English language – Wikipedia gives a nice definition here. I was all of three months old when this happened. In the aftermath, I’m told a number of things took place. Doctor Evil apparently was reluctant to supply the photos of the ‘before’ shots to my Mum of the state of my leg, who wanted them so I could see what my legs looked like when I was a baby and understand the situation I was in when I was older (apparently there was fear of a lawsuit in there, hence why there were issues with getting them). I’ve had… 11 or 12 operations on the leg since the initial operations over the years – skin grafts, clean-up jobs, I’ve had the growth plate removed, and the last two operations were in 1994 and 2001, both of which were due to a bone spur protruding from the end of my stump on the left side thereof (both happened at the same ‘site’ on the bone). Given the base of the stump has to deal with the weight/impact of walking, these were somewhat inconvenient – the first case was annoying in that I’d only been in hospital three months earlier to have my appendix out, and the latter caused issues as I had the operation a few weeks into the first semester of Uni that year. This meant I had to reduce my study load to a single subject, couldn’t work for over three months, and couldn’t walk for almost the same period of time. Oh yeah, and it was bloody painful 😛 I mean, you wouldn’t think chopping off a small chunk of bone would hurt that much, but by slicing open all the muscles at the end of the stump, working on the bone, and then tying it all back up again… damn, it hurt. And that pretty much sums up my amputation. I was three months old, so the lucky bit is that I only had to learn how to walk once, and can’t remember any of the painful stuff. I’m generally not phased with having to go to the hospital for any reason because I used to be in there so much when I was growing up, and I’m grateful to all the medical staff who looked after me as a kid, and for the great people who have built my legs for so many years. I might have to see if I can get this site passed along to one of the guys who looked after my artificial legs since I was a kid – I reckon he’d be stoked to see how things have come along, considering he’s known me since I was so young. I’ll post something else up during the week, probably before Wednesday in prep for training, followed by a general post-training blog on Thursday or Friday if I can squeeze it in before the end of the week 🙂 So yeah, I hope you enjoyed the story! !